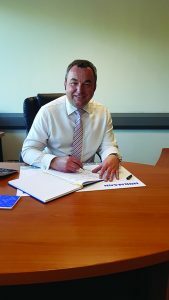 Leading door manufacturer, Hörmann UK, has announced the appointment of a new Managing Director, Wolfgang Gorner. With a wealth of knowledge and experience in the building industry, Wolfgang joins the company with a practical mind and sound technical understanding. His background and success in a number of sales and marketing roles has proved him to be both an expert in his field and a dedicated team player. Throughout the past 23 years, Wolfgang has been operating in dealer sales, working with businesses such as Rehau, Sto, Epwin and Inwido. Following the recent departure of Simon Hipgrave as former Managing Director, his successor is looking forward to making a positive impact on the business. He commented: “I am very excited at the prospect of working with such a respected and recognisable brand as Hörmann. We have a fantastic team in the UK and together we will build on the notable successes already gained, and with the help of our customers, ensure that Hörmann is and remains the partner of choice.” The team at Hörmann is confident that with Wolfgang’s expertise and thorough understanding of the industry, they have a promising future ahead. For more information visit www.hormann.co.uk.